I had a good day at the thrift store last week. I was just popping in to see what bags of crafty goodness they might have and I hit the mother lode! 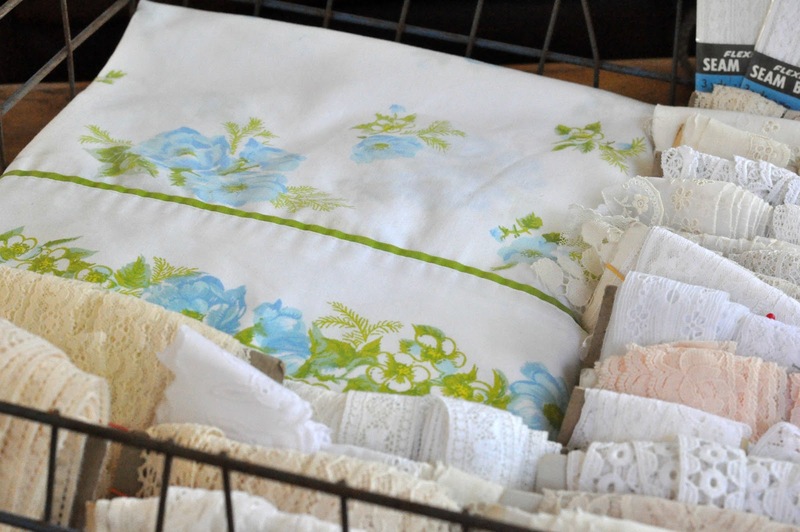 I've told you before that one of my local thrift stores has a section of bagged up threads, beads, zippers and lace. It is a hit or miss kind of thing and you really need to bend down and move some things around. I am such a wimpy thrifter and digging through piles of dusty junk is not my favorite thing to do but this section has produced such gems that it is totally worth it. Most of the bags are marked $3.95 no matter what is in them. Remember my amazing bag of embroidery threads?...$3.95 and my bag of 108 zippers?...$3.95. Now add to that list my ginormous bag of lace. Believe it or not I almost set this bag back down. It didn't look that promising when I first spied it. It had a few zippers and some old elastic tucked in it. In fact, if it wasn't for this luscious vintage sheet I found for $2.00 and was going to wait in line to pay for anyway, I might very well have walked out without all this loveliness. Thirty different cuts of lace and most of the lengths are pretty substantial. A few over 10 yards long! Okay, am I the only one excited about this score? Now my A.D.D. 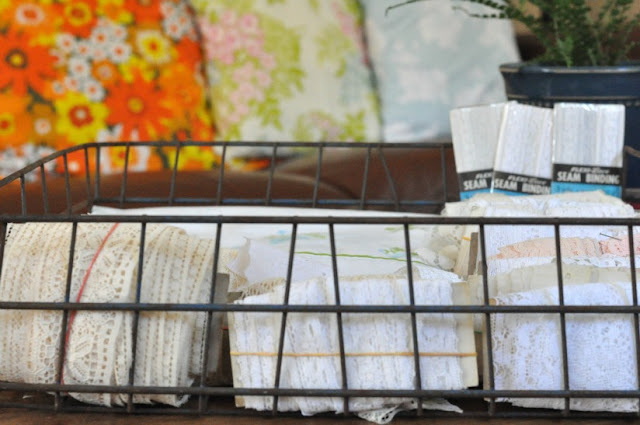 crafters mind is reeling with the possibilities! On another note, I used my Christmas money to sign up for this photography class. You will find me this Saturday at the Crescendoh Studios in Santa Ana trying to figure out how to really use my big girl camera. It sounded like such a good idea at the time but now I am wondering how much this old girls brain can really absorb. I will let you know on Monday...by then the smoke should be done coming out of my ears! Patty, wow, what a wonderful find....bet your mind is racing! Good luck with the photography classes. That is a score! 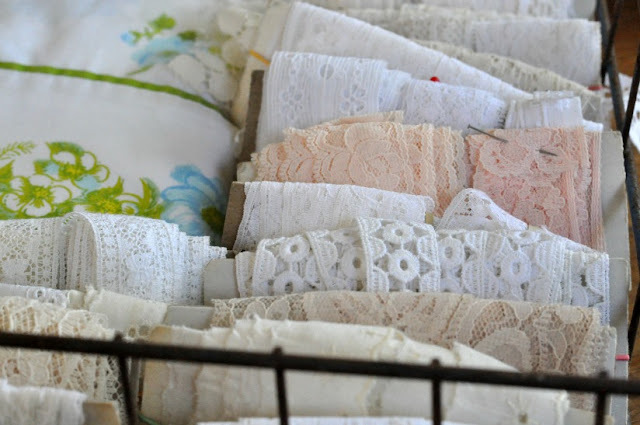 Love finding vintage lace! That is the kind of score that I love to find at the thrifts!!! Wow!!! Love that sheet too!!! So pretty! Good luck with the class. I took a couple online classes and really enjoyed them. You will learn a lot for sure!! Patty ~ Isn't it funny sometimes how we just walk by and then it catches our eye and Wham ~ score ~! Wow, wow, wow!! Great finds Patty!!! Great find! 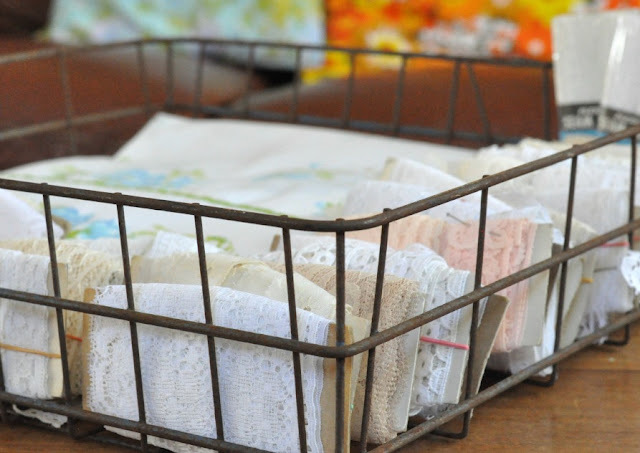 I just love a basket or compote piled high with loose lace...have fun! I think you got a great find! Beautiful lace and that sheet is so pretty. As for the photography class, you can do it Patty! Patty - I am salivating over all of that lace!! What a haul!! Bet that made your heart beat faster. LOL Enjoy the photography class. I've thought about that, but then, I have Brenda!! What a great find! Love all that lace! Enjoy your photography class! Wish I was closer as it sounds fabulous! 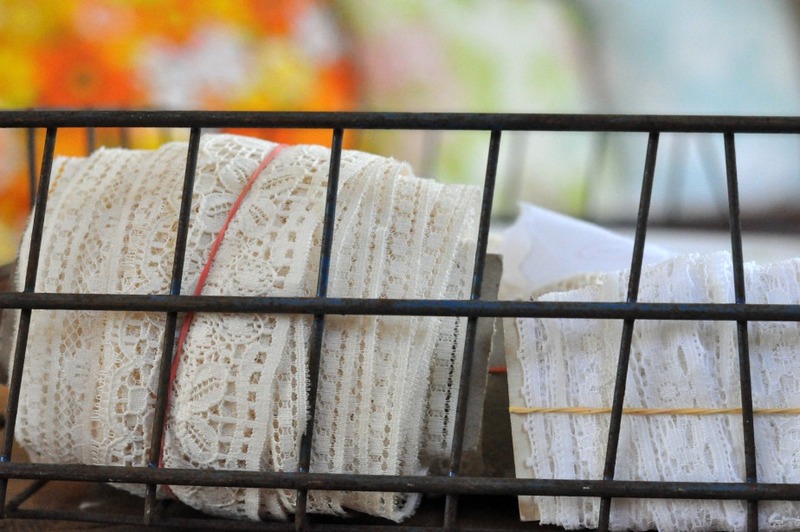 Believe me, I understand your excitement over your recent thrifty find of lace!!! A recent post tells of my same thoughts about hemp!!! Congratulations on and good luck with your photography class!!! I keep trying new things to improve my photography skills and looking into a class in our area is on my next "To Do" list!!! That sounds like a great shop! Nothing here in the Inland Empire like that one! I started a web design class last week...I think next will be photography...have fun!! Definite Score!.. LOL...Sounds like you have a nice shop there. I have yet to find a decent one in my area but there is one that just opened not long ago that I have to get over too. Im a bit afraid though because from what I see in the window I think I will spend to much.. LOL.. I can't believe all the lovelies you found. The vintage sheet is a great color. I wish I could find treasures like those. Great scores! Great find!! We have a local thrift shop where I used to find things like that, but for months now...no great finds at all! I just love visiting you! Your blog is so cheerful and full of color. Amazing! You really did hit the jackpot! One of our thrift stores does the same with fabric, yarn and trim and once (in 10 years) I got a wonderful bag full of different trims. I still haven't used most of it. Boy did you score big time. I would have been shouting for joy. 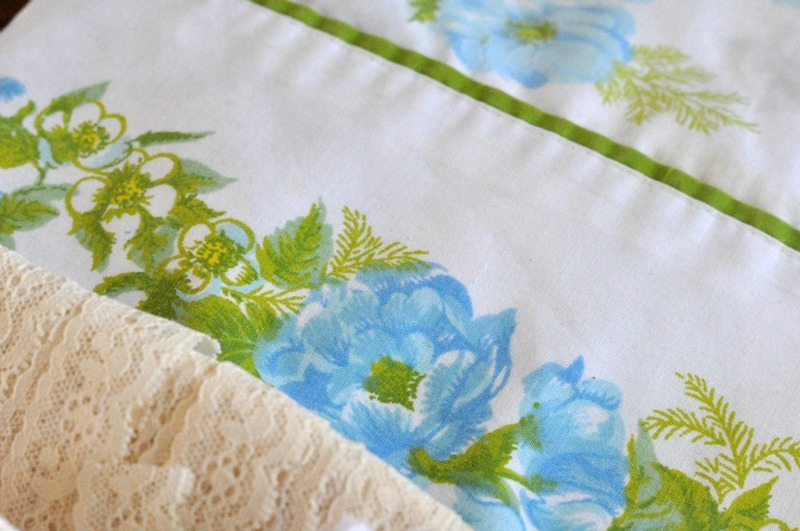 A vintage sheet and all that lace. I never find lace or buttons anymore at the thrift stores. I always think someone must get to go through stuff before it goes on the floor to sell. I am so anxious to hear about your photograpy class. One of the reasons I haven't bought a new camera is thinking I couldn't learn how to use it...the other being expense, but that's another story. I think you already take great pictures.